Information is detailed below on what goes in your blue bin. e.g. Yoghurt and pudding pots, noodle pots, ready-made soup and pasta pots. e.g. Ice cream, margarine tubs, ready meal tubs. 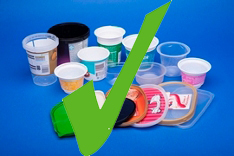 Tip: Take the lids off and put them in the blue bin too. e.g. 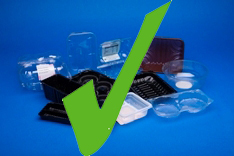 ready meal and microwave food trays, fruit punnets, biscuit trays Tip: Rinse to make sure they are not contaminated by food waste. e.g. lids from plastics bottles, margarine tubs, ice cream tubs and coffee jars. Remove lids and put them in the blue bin. e.g. Plastic drinks, detergent and shampoo bottles. Lightly rinse and squash them to save space. Tip: Remove the lids and put them in the blue bin too. You can recycle clear and coloured plastic. e.g. Clean carrier bags, bread bags, pre-packed vegetable bags, cereal and pasta bags. 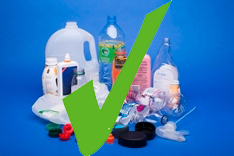 Tip: Please don't put anything inside plastic bags, it prevents them being separated at the recycling facility. e.g. 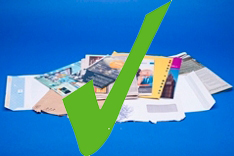 Newspapers, coloured magazines, brochures, catalogues, unwanted mail, envelopes, including those with windows, shredded paper, phone directories, yellow pages Tip: Remove the plastic bags from junk mail or magazines and put them in the blue bin too. e.g. 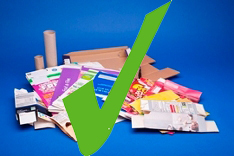 Cereal boxes, kitchen and toilet roll tubes, washing powder boxes, corrugated cardboard boxes Tip: Flatten cardboard boxes to save space. e.g. 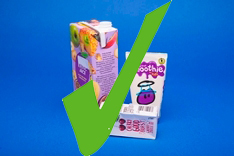 juice, soup, custard and smoothie cartons. 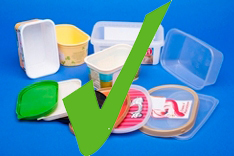 Tip: Flatten to save space and remove lids and put them in the blue bin too. 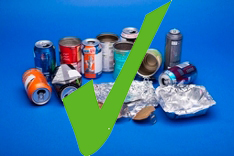 Tip: Make sure aerosol cans are as empty as possible and that foil and cans are not contaminated by food waste. You don't need to remove labels. Put the lids in the blue bin too. Materials contaminated with food waste. Food waste spreads through the load when compressed in the collection vehicle, so the paper and cardboard becomes wet and dirty and can be rejected by the recycling facility or manufacturers This is our biggest problem with contamination. Nappies, pet excrement, general household waste, other wet wastes. Wet materials spread through the load when compressed in the collection vehicle, so the whole load can be rejected by the recycling facility or manufacturers. 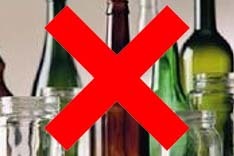 Glass is usually broken by being compacted in the back of the collection vehicle and spreads when deposited at the recycling facility. 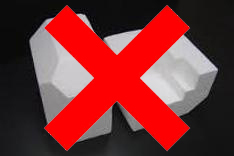 It can then hurt the staff that sort the materials on the manual picking lines and it also contaminates the paper, cardboard and plastic, which means that it can be rejected by the manufacturers. Materials placed inside plastic bags. At the materials recycling Facility blue bin material is spread out by a low level bar as it goes onto the conveyor belts for mechanical, then manual sorting lines. 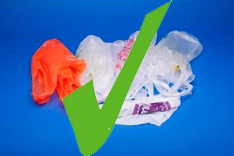 If material is inside plastic bags it prevents it being separated for recycling. In addition unfortunately plastic bags often contain material like food waste, pet waste and general waste, which if opened spread across the conveyor belt, causing the whole process line to be stopped and cleaned, causing delays and increasing processing costs. Clothing, textiles and shoes cannot be accepted in the blue bin. They also absorb any food and moisture when mixed with the load in the back of the collection vehicle and become soiled and unusable They also cause operational problem at the recycling facility as they wrap round the wheel of the conveyor belts at the recycling facility, which have to be stopped and cut out. Polystyrene packaging, polystyrene egg cartons and polystyrene food trays. The recycling facility is not designed to capture this material. Potential to damage sorting equipment and recycling facility not designed to capture this material. 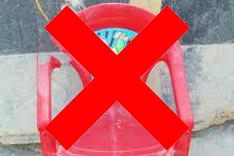 Please do not place any material inside plastic bags. This prevents the material from being separated for recycling at the Materials Recycling Facility. 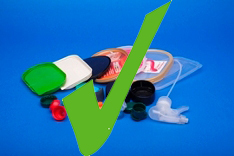 If your blue bin contains items in black bin bags or bin liners it will not be collected.